Born on Chicago’s south side, Larry Gray is considered by many to be one of jazz music’s finest double bassists. His impressive versatility and uncommon musical curiosity keep him in demand as both a leader and sideman. Larry began his musical studies at the age of five when his father brought home an accordion and introduced him to his first teacher. Invigorated by this study, Larry added the guitar to his arsenal and studied piano seriously for many years thereafter. It was not until he was in his twenties that he decided to switch to the double bass. Larry went on to study classical music extensively, eventually adding the cello to his long list of loved instruments. His principal teachers were Joseph Guastafeste, longtime principal bassist of the Chicago Symphony Orchestra, and cellist Karl Fruh, a highly regarded soloist and teacher. Under Mr. Fruh's guidance, he received bachelors and masters degrees in cello performance from the Chicago Musical College of Roosevelt University. Throughout his long and varied career, Larry has worked with numerous exceptional artists and jazz legends, including McCoy Tyner, Jack DeJohnette, Danilo Perez, Branford Marsalis, Benny Green, Freddy Cole, Benny Golson, Steve Turre, George Coleman, Lee Konitz, Bobby Hutcherson, Sonny Fortune, Ira Sullivan, Junior Mance, David "Fathead" Newman, Willie Pickens, Ann Hampton Callaway, Charles McPherson, Antonio Hart, Jackie McLean, Sonny Stitt, Eddie "Lockjaw" Davis, Al Cohn, Randy Brecker, Nicholas Payton, Kurt Elling, Eric Alexander, Phil Woods, Jon Faddis, Roscoe Mitchell, Von Freeman, Wilbur Campbell, Eddie Harris, and Les McCann. In addition, he has collaborated with guitarists Kenny Burrell, Joe Pass, and Tal Farlow, as well trumpeters Donald Byrd, Harry "Sweets" Edison, and Tom Harrell, among others. Larry continues to tour extensively, performing at jazz festivals and clubs around the globe, including the Umbria Jazz Festival, the Havana Jazz Festival, Rio Sao Paulo Festival, North Sea Jazz Festival, the Montreal International Jazz Festival, ECM Festival in Bielsko-Biala, Poland, the Poznan Jazz Festival, Monterey Jazz Festival, the Montreaux Detroit Festival, the Chicago Jazz Festival, Carnegie Hall, Lincoln Center, the Hollywood Bowl, Village Vanguard, Blue Note (New York and Tokyo), Kennedy Center, and the Ravinia Festival, with such jazz luminaries as Marian McPartland, Clark Terry, Nancy Wilson, Frank Morgan, James Moody, Larry Coryell, Louis Bellson, Barry Harris, Dorothy Donegan, Monty Alexander, Frank Wess, Joe Williams, Doc Severinsen and the Tonight Show Band, Kenny Drew Jr., and most recently, Ramsey Lewis. 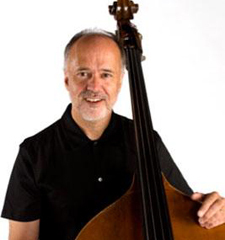 As a classical musician, Larry played several seasons with the Civic Orchestra of Chicago, including a year as principal bass. He worked on many occasions with the Chicago Symphony Orchestra under master conductors Erich Leinsdorf, Rafeal Kubelik, Carlo Maria Guilini, and Sir George Solti. He also was the featured double bassist with Lyric Opera for the world premiere of the opera Amistad.